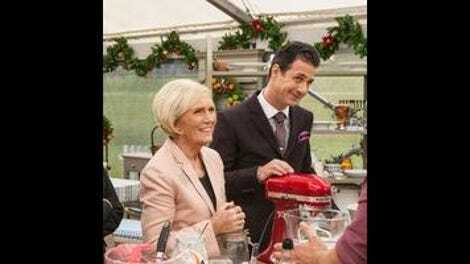 There’s a central contradiction at the heart of the Bake-Off format. On the one hand, it positions baking as a space of technical skill and precision: with the Technical challenge, and with the exacting standards of the judges, it expects a certain level of consistency in the bakers’ performances. But on the other hand, it also wants the bakers to experiment, to try new things and push the Signature and Showstopper bakes in exciting new directions. From a competition perspective, I have to think this can be frustrating: the risk/reward balance is constantly shifting from week-to-week, and from challenge-to-challenge. But it also just embodies what baking is: you have a recipe, but that recipe is ultimately a chemistry experiment, just waiting to be fiddled with for different results, or adjusted wildly to take the bake in an entirely different direction. I spent this evening preparing for tonight’s Great Holiday Baking Show finale working with one of my grandmother’s recipes that might as well have been a technical challenge: while some minor ingredients had no measurements, it was the “Flour to Roll” that created some confusion as others in the family went to recreate the recipe. And while there is no doubt that there is a technical answer to recreating her “Thick Sugar Cookies,” the process comes down to experimentation, and baking them created lots of crossroads where different choices could result in a whole new recipe. Developing a new version of a reality format is a lot like baking: as I wrote in covering the series’ premiere, this is ultimately a fairly technical recreation of the Great British Bake-Off—or Baking Show, in the U.S.—format, produced by the same company and featuring one of the same judges. And it has been tempting over these last few weeks of solid reality television to judge it by that technical standard, rejecting the (limited by time) experimentation of hosts Ian and Nia, or feeling like the contestants are stepping outside the bounds of how bakers are “supposed” to conduct themselves. Like any good comfort food reality programming, we’re conditioned to feel like experimentation is a threat to what we love (and as someone who does not muck about with recipes, I can relate). These responses are reasonable, ultimately, but I admire the experimentation of The Great Holiday Baking Show. It’s a show made by people who know the format well, but also understand that adjustments are necessary (and valuable, in terms of understanding how the format ticks) when making the move into a new market. 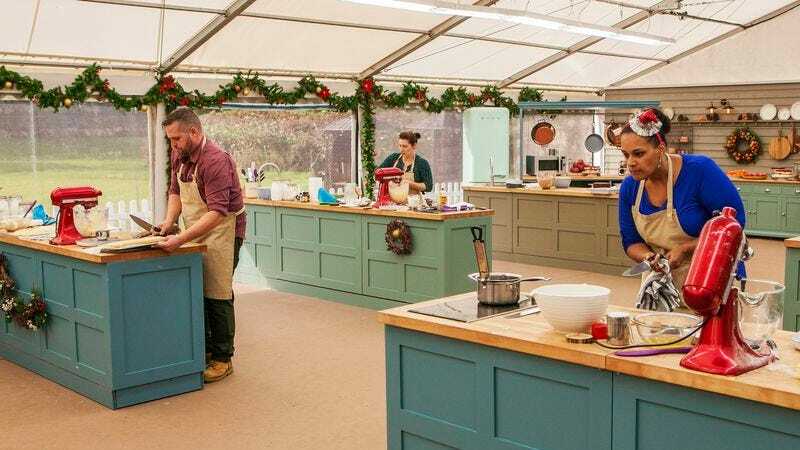 It’s also a show whose contestants may well have never seen The Great British Bake-Off before auditioning for the series; based on Nicole’s insights in the comments of last week’s review, she participated in this series without watching the original, and so they were likely experimenting with a new format themselves. Adaptation is all about adjustment, of balancing precision with pursuing new opportunities, and over four weeks I thought The Great Holiday Baking Show showcased some fine television exploring that process. In the end, though, four “weeks” was just never going to be enough time for everyone to adapt to baking in a competition setting. From week one, Lauren’s finishing skills placed her a step above her competition, and there was never a point where she seemed confused with how to approach any given task. While she had some time management issues last week, Lauren always had an air of confidence that seemed like it would provide the steadiness that would lead to victory. In a full-length season, other bakers might have had time to find their rhythm and adapt their style, but over only four sets of challenges this was going to be won by someone who didn’t have to feel like they were experimenting with every single bake. There’s no surprise when the Showstopper concludes with Lauren the first victor of The Great Holiday Baking Show. Although plagued by a few more time issues during the Signature bake, everyone agreed her pie was ten minutes away from perfection, and she won the Technical with the finishing work that has won her high marks from day one. And so when she went into the Showstopper, she took some risks on flavors, the judges responded well to her cherry and pistachio three-tiered cake experience, and the quality of the cake’s exterior made up for some struggles inside. It was not a perfect bake, but Lauren has never necessarily been perfect. Instead, she has made her name on solid execution that comes with a level of presentation and professionalism that her fellow contestants have lacked. Nicole is not a professional baker, and she’s never pretended otherwise. Her performance in the finale—which we can equate to a second place finish, all told—perfectly captures her Baking Show experience: her Signature showcases her southern flavors and wins over Mary (who had never had Sweet Potato Pie before), but her Technical turns into a disaster when a Proving Drawer mishap—it happens to the best of us!—leads to a series of unfortunate events with her candy-cane cranberry bread. By the time she gets to her Showstopper, it’s everything you’d expect: some experimentation with flavors, a showy “Everyone gets a piece of Baby Jesus” surprise, and an unintended “Buttercream surprise” when she ran out of icing. While Nicole didn’t have enough time to fully adapt to the Bake-Off format, she went out baking her way and ended up winning over the judges in the process, and she certainly has the most complete “personal journey” to bring the season to an emotional close. Tim, meanwhile, unfortunately brings the season to a close reminding us that this is a different type of show when it features less experienced bakers. Tim’s Signature bake is the type of mistake that one is used to seeing early on in Bake-Off, an apple-cranberry pie that has soggy bottom written all over it, and goes one step further to basically end up soup by the time it leaves the oven. He never quite recovers: his decorating work holds him back on the Technical, and then his Showstopper ends up being the yang to Lauren’s ying, with fondant that he charmingly recognizes as the equivalent of a child attempting to wrap a real present. He knew he had to blow them away going into the Showstopper, and the fact is that Tim isn’t a cake decorator on the level of Lauren, and nothing inside his cakes was going to be enough to change his fate in this final challenge. In the end, it’s a successful finale as long as we accept that this didn’t end up being about finding the “best holiday baker in America” as the show purports. With only six contestants, and without the kind of nationwide search structure that underlies Bake-Off, this was more of an experiment than it was a competition. It brought together six individuals and asked them to bake under circumstances they’d never bake in, and to test themselves and their baking skills. And while this finale was not as much of a competition as it could have been thanks to the uneven performances from the bakers other than Lauren, and the level of baking was always a bit lower than we’re used to, there was still a real humanity to this conclusion. Even if I don’t buy Lauren’s claim that her other bakers were “amazing” in the context of the format more broadly, I think the contained and likely foreign concept of this particular set of challenges was met admirably, and in ways that make this a significant victory from her perspective. “Significant” is not the word I’d use to describe The Great Holiday Baking Show: at only four weeks, it feels like we’re only getting started, and my mother—who hasn’t been watching—was a bit incredulous to learn it was already ending. But “slight” need not necessarily be an insult, provided that the series delivers on the type of confection it’s designed to. And while I don’t think Ian and Nia ever became entirely comfortable, and I think the shorter running time cut down on any flow they could have managed in just four episodes, the general tone of the show was never the problem. This was a holiday baking show, and it featured holiday-themed baking and the jaunty music and B-roll Christmas ornaments that go with it. Given the shorter order (necessary given ABC’s packed schedule), I felt it managed to adapt the format successfully, if not necessarily in the way I would have desired. I hope the show’s ratings justify a slightly longer season next year, or potentially a slot in the summer with a longer series. I hope that the increased profile gained by this series and Bake-Off’s new “Baking Show” life on PBS and streaming services can draw a group of bakers who understand the show and who can raise the level of competition. I hope that Ian and Nia, if they were to stay, can channel what feels like legitimate enthusiasm for the show into a hosting identity that can be more successfully captured in the limitations of the broadcast format. I hope that they can also find ways to continue experimenting with the format, maintaining the strong ties to the steadfast British series to think about ways this new version could take the format in different directions. That’s a lot to ask, and I think the burden of expectations was ultimately too much for The Great Holiday Baking Show to carry over such a short period. But this finale was a nice way to tide us over until PBS gets around to airing the most recent season, and if nothing else reinforces America’s appetite for more from this franchise heading into 2016. My thanks to Nicole for dropping into the comments last week—I’m always fascinated when reality contestants drop into reviews, as there’s always such a fine line between reacting to “portrayals” and actual people when watching reality programming. In this case, the edit—and a lack of other big personalities—meant Nicole was really the only “character” constructed, so I’m grateful to her for being willing to engage and discuss the show with us. Given how much time they have in each episode, I think we could have done with a few less “Nicole reacts to Bread” faces, but I did appreciate how consistent they were throughout the challenge. My colleague Carrie Raisler and I were discussing the technical challenge: Johnny “designing” a Holiday-themed bake to test a variety of bread/jam/finishing skills is outside of the norm, and there are certainly real holiday breads to be made. But I think they wanted something more conspicuously holiday-like, and this fit the bill. No amount of fake snow and jackets could make this really look like winter, but I appreciate the effort. “That wasn’t luck, that was all baby Jesus!”—I was really hoping that Nicole was about to say that it was actually skill (even if Johnny immediately noted the cake was overbaked and Mary didn’t care for the texture), but alas. Did I miss something, or did they not even show the judges tasting Nicole’s checkerboard cake? I realize they had reactions to show, and I know the result was never really in doubt, but weird to see a cake go untasted. Thanks to everyone for reading, and commenting—it’s been a lot of fun. I imagine that the lengthy delayed (still hypothetical) airing of Series 6 on PBS might make coverage challenging, but let’s not count out Bake-Off-mentum. In the meantime, let’s discuss what changes we’d like to see if they manage to make a full American version stick at ABC or elsewhere in the future.